Tags: Electronic Product Design, Embedded Electronics, Software Development, LED Advertising, LED Signs & Signage. Advertising space has become a very competitive cost driven market and finding new ways to promote your brand is challenging. From the humble Zoetrope to smart-phone technology, animation has always captured the human imagination. Creative ways that combine electronics-design and LED-technology, to break new ground, is constantly evolving. 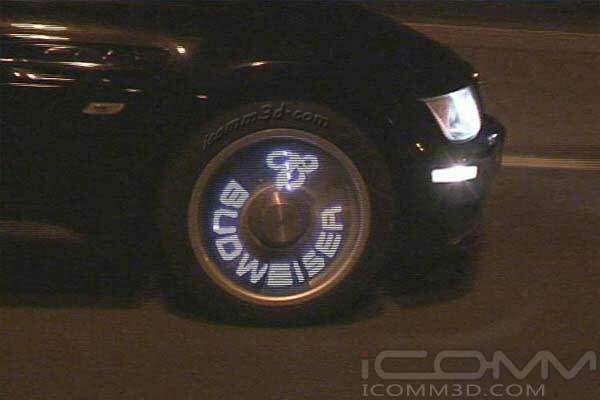 Using the latest embedded microprocessor technology, from concept to fully functional prototype, allowed us to create a very eye-catching - wheel mounted - LED advertising display. Demonstrating spectacular results, with the ability to re-map text and graphics to display animated brand messages from stored memory. Adding real appeal to the final product design.